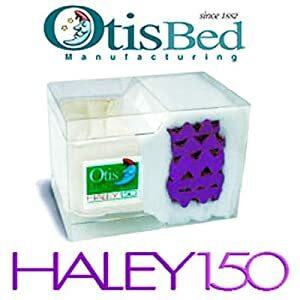 #1 FOR THOSE WHO REQUIRE EXTRA-FIRM SLEEP - The Otis Haley 150 is a premium quality product that offers unparalleled comfort, durability and state of the art manufacturing innovations. This mattress contains 9" of HD Foam surrounded by a 1.5 inch layer of thermal bonded polyester wrap all compressed into an 8" case made of premium quality 7.5 oz twill fabric. Unlike classic style futon mattresses with rounded edges Otis futons have tailored box edges and compression tufting to create a supportive synergy that produces a superior comfort level. The Haley 150 is made in the USA and comes with a 10 year manufacturer warranty. NOTE: The Haley150 is made to remain flat and is not intended for use on futon sofas or loungers.